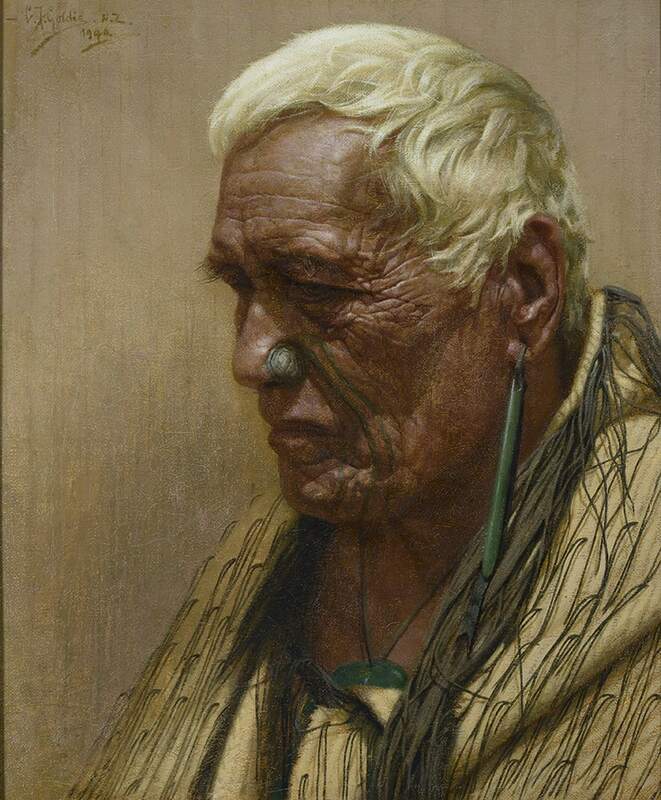 Tamati Pehiriri, of Ngāpuhi iwi, Te Rawara territory, Hokianga, sat for Goldie on a number of occasions, including for another portrait titled Whitening Snow of Venerable Age which was bequeathed to Robert McDougall Gallery by the estate of Robert Bell. This portrait comes to life through a sense of intimacy and interconnectedness. The work seems to exist between the realms of ancestral mythology, fiction and reality, emanating the truth of its own physicality. This is shown on a purely formal level - take, for example, the dissolution of boundaries between the material reality of the canvas and the neutral background, or the single line representing Pehiriri's moko which is transformed into the thread of his pendant. One cannot help but be struck by the tactile interplay of cloak, hair and skin: textures which mimic and offset one other. These formal qualities all lend immediacy to a work which exists in constant dialogue with itself. Portrait of Tamati Pehiriri possesses many qualities of the archetypal European portrait, the genre to which Goldie demonstrated strict adherence throughout his career. Under the artist's gaze, the restrained - arguably passive - expression of the sitter has been concentrated to convey tension, to raise questions and implications, and to pursue the form's enigmatic potential. It may have been to this end that Goldie chose to further decontextualise his sitter: unlike many earlier works where there is a carved, flax woven or natural background surrounding the figure, all extraneous detail has been stripped away. Pehiriri's hei tiki is quite literally concealed, suggesting that the artist's intention for the viewer was one of more subtle deduction. The resulting portrait is one borne of sensory and spiritual relationships. It continues to inspire a philosophy of reverence, anonymous or otherwise, for Tamati Pehiriri.